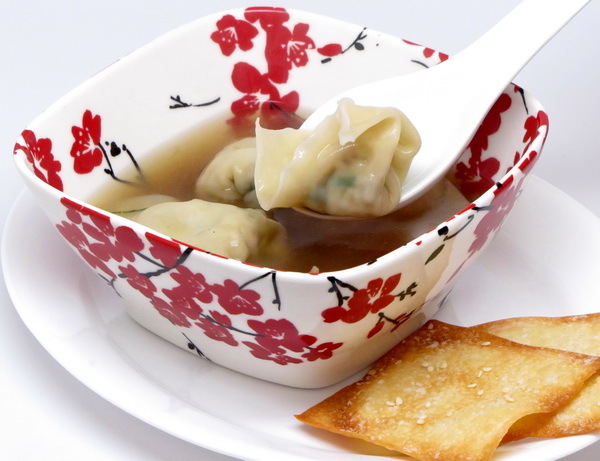 I love making wontons – you fill them with just about anything and drop in broth and they make a great meal. But this one goes far beyond – the flavors of the ginger, lemon and vegetables mingle so beautifully ! You’ll want to make this one again and again. Prepare wontons (see below). Bring broth to a boil. Add 3 T soy, salt and pepper. Add wontons and cook 3 minutes or until done. Add lemon juice right at the end. Spray pan with Pam and cook shallot 3 minutes. Add water if it starts to get dry. Add ground meat and cook until done. Make sure you break it up into little pieces as it cooks. Let cool. Add in bok choy, mushrooms, soy sauce, salt, pepper, garlic powder, ginger, lemon zest, sesame oil, and hot sauce. Fill wontons (click below for a short video tutorial if you are not familiar with wonton preparation). Very orangey – very authentic – very, very good ! Mix pork, wine, soy, cornstarch, salt and pepper. Set aside. Heat the oil in a skillet on high heat. 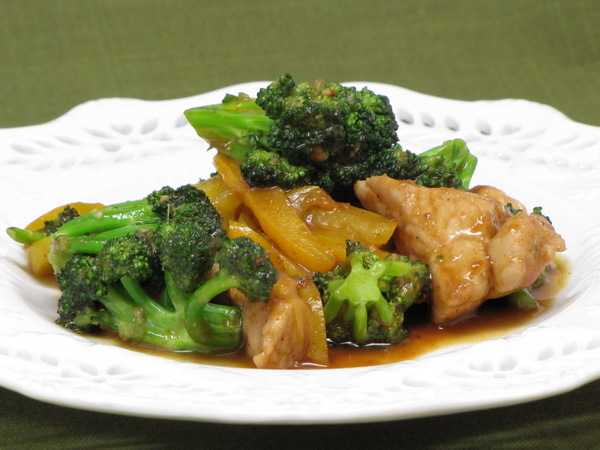 Add broccoli and pepper and stir fry for 3-4 minutes. Add the pork and stir until browned, about 5 minutes. Add the finer and cook 1 minute longer. Add the juice, hoisin sauce and honey and cook until pork is done and sauce is thickened some, about 3 minutes. Serve with the hot cooked rice on the side. 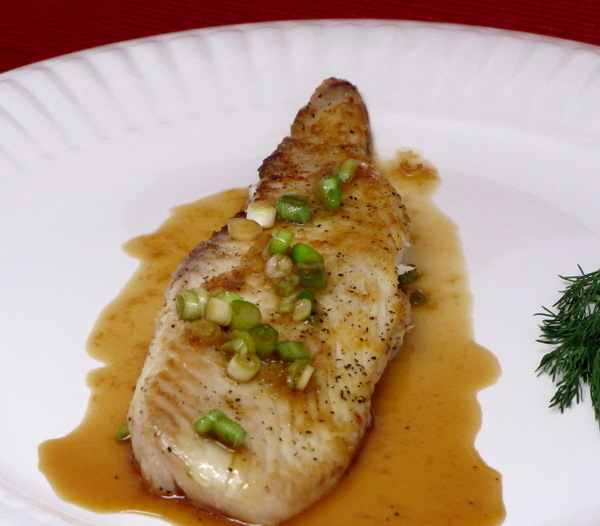 This is a very aromatic meal and the sauce can really be used on any white fish, delicate or firm. I make a little extra sauce and really smother the fish for extra goodness. Prepare dressing by placing all ingredients in a bowl and mixing well. Heat oil in a non stick skillet on medium high heat. Sprinkle fish with salt and pepper and cook 3 minutes each side or until fish is opaque. Top each fillet with 2 T of dressing. The colors are so vibrant that you can taste this dish with your eyes ! And the flavor was just tremendous !!! I served it with a little brown rice right in the broth and it was a meal that we are still talking about. You definitely have to try this one. In a large non aluminum skillet bring broth ingredients to a boil over high heat. Rinse and dry fish. 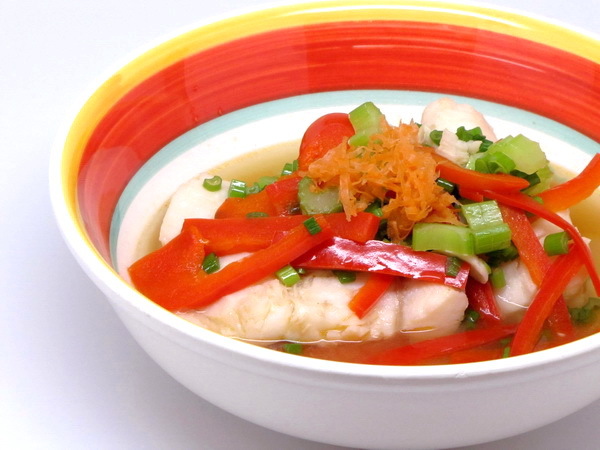 Reduce heat and place fish in broth. Add water if needed to cover the fish all the way. Simmer for 10 minutes per inch of fish thickness or until fish is done. Remove fish with slotted spoon and place into 4 soup bowls. Boil liquid and add green onions, peppers and celery and cook 3 minutes. Remove and discard lemon and ginger. Take vegetables and place over fish. Stir oil into broth and then pour into bowls. Sprinkle carrot over bowls and season with pepper. This is a great, crisp side dish that can be paired with just about anything. I bet it can even get cabbage by your kids 🙂 Add a teaspoon of chili sauce with garlic (found in the Asian section of your market) to make this a super spicy dish. Heat oil in a skillet on medium low heat. Add the garlic and ginger and cook for one minute then add the broth and ¼ c water and cover and cook for 7 minutes. Add the bell pepper and carrots and cook 1 minute then add the cabbage and mix well. Sprinkle with sugar and salt and cook 5 minutes or until cabbage is tender. Drizzle with the sesame oil (and optional chili and garlic sauce) and serve immediately. These are the perfect little appetizers. You don’t really taste the cream cheese, but it’s there for the onion flavor and to keep the pork moist. These would also be great dropped in hot chicken broth and boiled for 5 minutes or so. 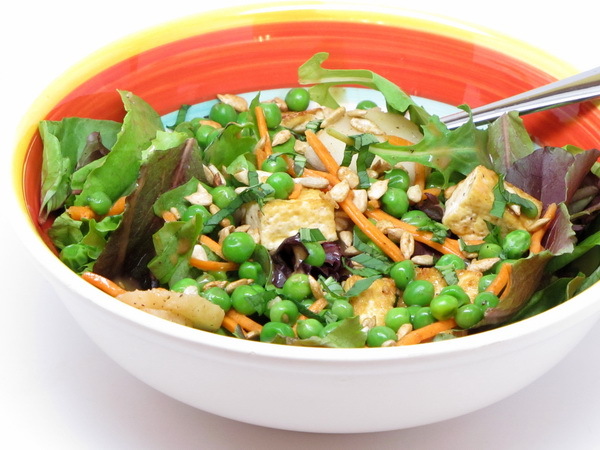 Serve a few next to a big green salad with ginger dressing for a nice light dinner. Preheat oven to 425 degrees. Mix pork, cream cheese, ginger and oil and place 1 T of mix onto each wonton wrapper. 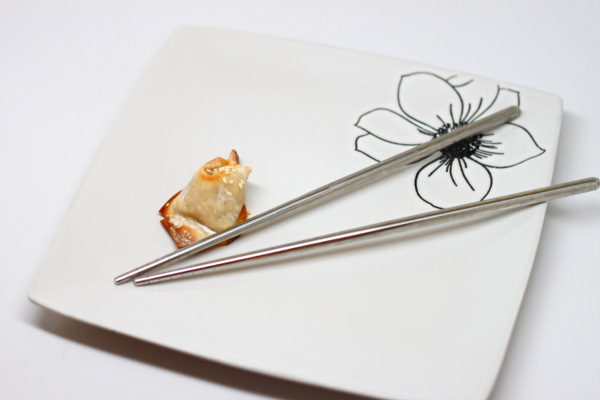 Fold into wonton shape (see the video below for easy to follow instructions). Spray a baking sheet with Pam and place wontons on sheet. Brush wontons with water and sprinkle with sesame seeds. Bake 10 minutes or until golden brown Then lower oven to 350 and bake another 5 minutes. Mix soy, rice wine and 1 T water and serve with wontons as a dipping sauce. Alternately you can serve with prepared ginger soy sauce. 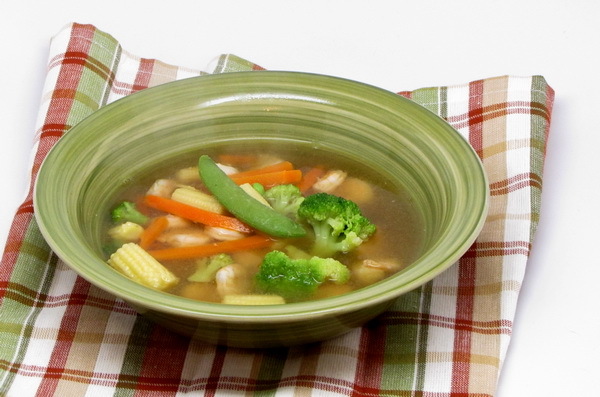 Such a great Asian inspired soup ! This makes a great lite lunch and all the veggies and shrimp really fill you up – it’s amazing, but you CAN feel full after just 125 calories !! Bring broth, water and ginger to a boil. Remove ginger and discard. Add veggies, shrimp, rice wine, soy sauce, spices and lemon juice. Cook 6-7 minutes and then add the sesame oil and serve immediately. I’m not a huge fan of tofu, but this is a really good salad. You feel so full, but there is no bloated feeling at all after you eat. This is a good skinny day lunch 🙂 Make sure you use sesame oil – it really gives the tofu a nice flavor. Press moisture out of tofu and cut into 1 inch cubes. Heat oil and add tofu and cook 5-6 minutes each side or until golden. Season with salt and pepper. 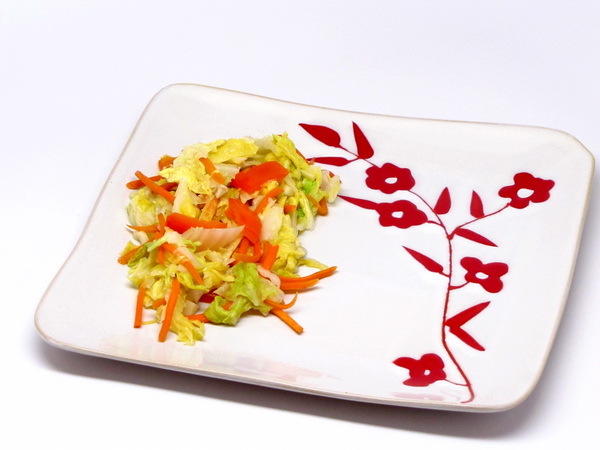 Combine with dressing, peas, carrots, chestnuts and pepper and then place on top of lettuce. Garnish with sunflower seeds and basil. Ginger and garlic just go together so well. And making a paste of them along with cilantro and sesame oil just adds so much flavor to the already flavorful beef. 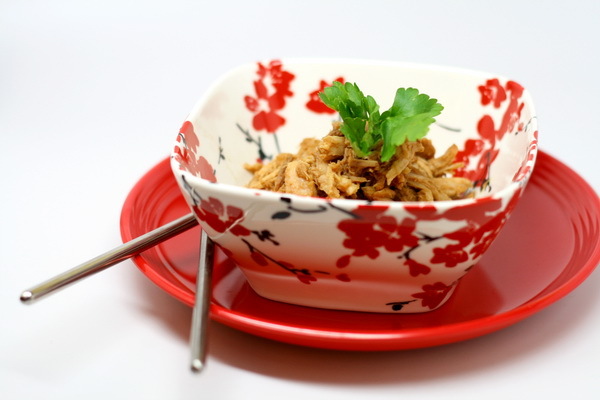 This is a great quick dish that you will make again and again. Preheat broiler. Spray baking sheet with Pam. Mix cilantro, garlic, ginger, water and oil in a food processor until a paste forms. 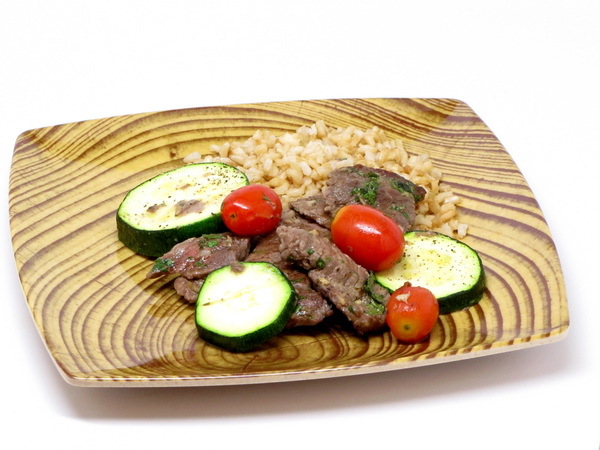 Place the steak in a bowl and add cilantro paste and mix well. Turn out the meat mix onto the baking sheet and add the tomatoes and zucchini. Broil 3 minutes. Stir well. Broil another 3-4 minutes. Serve with warm brown rice.